How to paint waterfall. 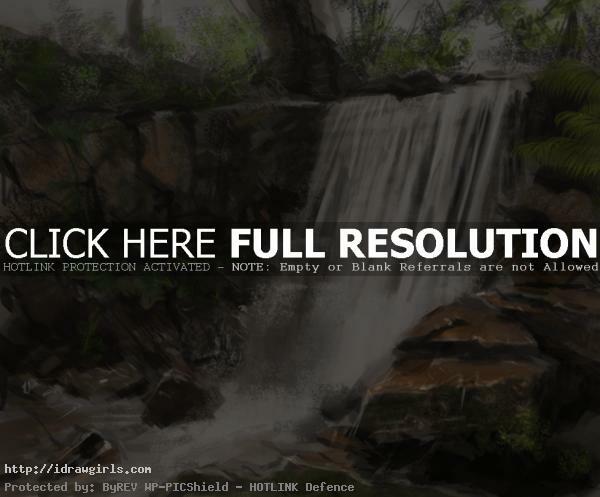 This video tutorial shows you how to paint waterfall landscape environmental study. You can scroll down further below to see step by step still images tutorial. This step by step video show you from lay down the base color, blocking in shape for painting to create under-painting then assigning value and color composition, and refining detail for the final concept painting. This one I have a reference but it is not exactly look alike. So basically it is my painting study that I recorded it then try to analyze and make a painting tutorial out of it. It is good to always practice painting from real scene in life setting. If you don’t have time practice from good photo reference, preferably the one you took it yourself. When you paint a lot of landscape, it help you understand natural setting more. Once you understand the usual lighting, natural setting then you can utilize them to make up your own environmental concept art to make them even more believable. I really need to do more landscape painting myself. 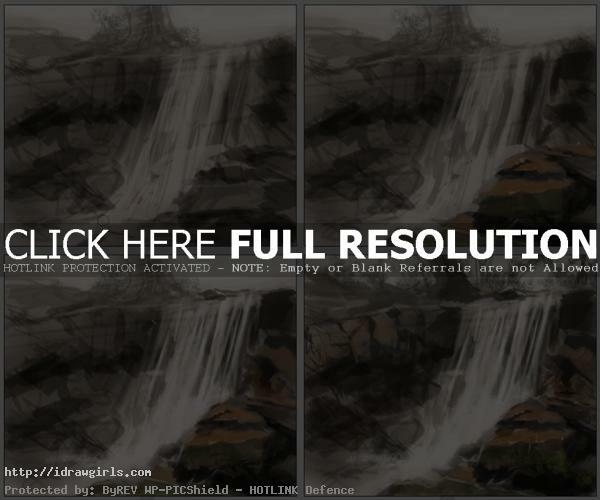 Below are step by step how to paint waterfall. You will see in the first set, how to compose a landscape sketching then how to start painting from the beginning to the finished piece. Step 1, I just start drawing line to make up the rocks by the bank on the right side of the river. Then a horizontal line indicates the top of the hill. Step 2, then I finish of the sketch of the other side of the river. Step 3, I begin to block in basic value using very light gray to begin with. Step 4, then I start to easing in and assign value to make the river bank actually look rocky. Or basically I called assigning value and composition. Then the painting step by step process. Step 5, I am trying to separate each element more by using value as you can see two side of the rocky land and waterfall in the middle. Their value are quite contrast so it is easier to paint. Step 6, after I assign base value and make it readable, I then begin to paint with some color starting from the right side. Step 7, now I am focusing on painting water and the texture of waterfall, splash and so on. Step 8, then I keep painting from right to left for the over all color. In final stage, I have to check for vegetation, rock value and texture, then overall balance of the image. And done! 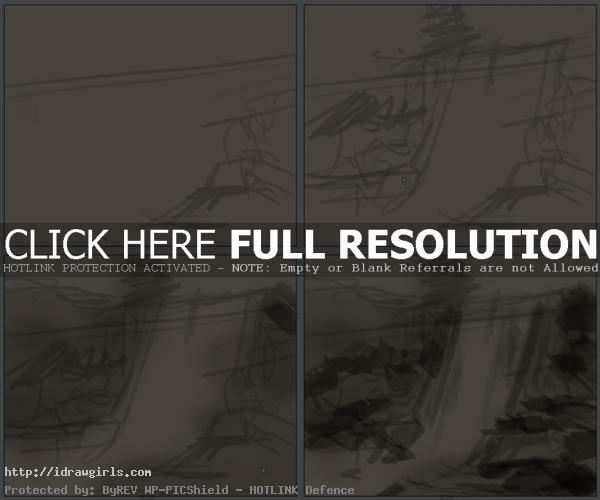 More landscape and environmental concept art painting tutorials. 1) Did you not see the banner under the video tutorial? this is a true masterpiece *-* I just have 2 questions …..
1) where can I find the brushes you used for drawing the waterfall ? 2) do you have an account on DA “deviant art” ?